Pasture is Always Better? Always? I’m up against the idea that pasturing animals is always better. Always. Better for what? Better for who? Under what conditions? This may seem like a strange point for me to argue but I don’t think it is necessarily so. Let me skip to the end and say that at under certain conditions it may make sense to preserve your pasture and increase animal health and comfort by sheltering the animals. I have been struggling with this question quite a bit recently, and mentioned it in a recent post. What problem I am really trying to solve by putting pigs on pasture. Am I solving a pig health issue? An ecological issue? A monetary issue? A pride issue? The answer to all may be “Yes” but let’s introduce the fourth dimension: Time. How long do you leave pigs on one specific pasture? Does a heavy rainfall change our management plan? Does incorrect timing hurt animal health, the ecology, our pocketbook or our pride? Yes. Am I really concerned about animal health? Or am I primarily concerned about what people will think of me if I deviate from the pasture model for a few days? Do you think customers want to mess with explanations? Q: Are your animals pastured? This is a little like the “Organic” question. They are finished with the conversation. The prospective customer has bought into the illusion that “Organic” is a meaningful term when in truth it is a government-owned monster with no teeth. Not only that but organic standards vary as you cross borders. What does it mean? And it’s not just about pigs. There are times when the pasture is better served if the cows are in the barn and the chickens are in the greenhouse on deep bedding. But not everyone agrees. And that’s OK. We don’t have to agree all the time. Right? Variety is the spice of life. Celebrate diversity and all that. Q: What problem are we trying to solve? A: We need to increase the farm’s fertility and water holding capacity. Q: So what do pigs have to do with this? A: Oh shoot! Pigs are the mechanism, not the problem. The problem has nothing to do with pigs at all. I’m trying to solve a fertility issue. Pigs are a tasty solution provider. But if we’re going to use pigs to help increase fertility we had dashed well make certain their needs are met. They need to be warm, comfortable, well-fed and active. And I guess if I’m providing fresh bedding of sufficient depth it doesn’t matter if there is concrete under the pigs or not. The problem is fertility. The solution is husbandry…on or off pasture. And I’m not alone in such thoughts. But maybe that’s why Salatin calls himself “Farmer” instead of a “Permaculturist”. Wanna see what he uses for winter housing for his pigs? It’s concrete. He puts concrete sidewalks in hoop structures so the pigs can’t “make huge craters that go all the way down to China“.The best picture I can find of it is on another blog. I don’t…can’t…won’t do everything following Mr. Salatin’s example but a big part of why any of us do anything we do is because we read a book or two of his. He is HUGELY influential to the current generation of alt. farmers. His video, Pigs ‘n Glens, shows, appropriately, pigs in glens. But it also shows pigs in hoop houses. He gives an example of an effort to get pigs off of pasture, being late, and having to wait out a heavy snow storm before bringing the pigs in. So for a short time his pigs were on pasture in the snow but that’s not the design. Where are his pigs in the winter? On pasture? Nope. And why? I asked a friend of mine who met Mr. Salatin some years ago. Pigs on dirt, might work in some places, and people only get to the first part of Salatin’s talk, hear the word pasture and that’s it. Never mind there are photos of their hogs in barns or hoop houses during the winter. I think I have a Smithsonian from 2000 and in it there’s a photo of Joel in a barn with lots of big hogs on deep bedding. He values his pastures too much, and I’ve seen his pig glens up on the mountain, they are very small and only visited once a year. No one wants to listen to that, it’s too extensive to only use that land once. Well, things change. We learn. We adapt. Apparently he now visits pastures more than once but let’s let him tell us all about it. He leaves 50 pigs in on a half acre for “about 5-10 days” (at 1:30), returning 3 times/year (things change). That’s very different than a recent Acres USA article suggesting that you can just leave pigs in place for two months. Salatin specifically says “landscape massage” (5:00) when discussing managing the disturbance. Managed disturbance. What does “managed disturbance” mean? Salatin says you don’t want too little disturbance. You don’t want too much disturbance. You want just enough. Just enough to encourage grass growth, not so much that you encourage weed growth (see the 3 minute mark). So how do you do that? Well, it depends. But where I live I have to keep the pigs moving from pasture to pasture before they turn it into soup. If it is raining, they have to move more quickly…or not be there at all. And that’s where I’m content to leave it. Where are my pigs? It depends. It depends on seasons. It depends on rainfall. It depends on heat. It depends how big the pigs are. It depends on what I need pigs to do. But I have no problem housing my pigs on fresh pasture, cattle bedding or asking them to work over the concrete slab. Wherever they are, it’s up to me to make sure their needs are met and meeting their needs every day is what is best for the pigs. I use pigs to help solve my fertility problem but that creates new problems for me to solve. Husbandry problems. Chasing dollars around a muddy pasture won’t save the world. Proper land and animal husbandry will. This entry was posted in Pasture Management, Pastured Pork. Bookmark the permalink. ← Where Did All These Cows Come From? I think what you’re talking about here really speaks to the issue that we shouldn’t try and box ourselves in with a paradigm or a label or anything like that. What’s important is the health of the soil, the fertility of the pasture, the health and welfare of the animal, and how these things contribute to productivity. I think Salatin himself would tell us not to get stuck in a paradigm. It’s one of the interesting things about Polyface, watching it change as they go along. Things he’s said years ago have been totally contradicted now. At first I was sort of shocked by that, but I’ve come to realize that he’s demonstrating how to stick to your farming values and still grow a viable business. Free range isn’t always best for the animal, depending on the critter and the conditions. Matron has for years been advocating that keeping her hens on deep bedding in a hoop house provides them with a far happier life and provides a service to her at the same time, than if they were in a dark coop with a dirt yard. Grass fed beef is one that gets me. I drive past a herd of about 25 steers every week, stuck on a muddy little paddock, maybe an acre – no shelter, pretty much no grass, but a big round bale to chow on. Yes they’re technically grass fed, but there’s no benefit in any direction there to soil or beast. The example of Matron’s chickens is a good one. I have little doubt that her small flock is healthy, has interesting things to do and are unlikely to be eaten. In fact, recent conversations with Matron are the inspiration of the entire post. But there are, I guess, two very different issues to address here. First I’m asking myself to step up and really make an honest assessment of what I’m doing and why. Do I have pigs because Salatin has pigs? Do I have pigs because I think they are fun? Or do I have pigs because I need their help? But there is a second issue here too. I, as a marketer, need to educate my customers. We do everything we can to keep the door open and invite our customers to come here and see what’s going on. See the chickens. Ask questions and give us feedback. Terms like “grassfed” and “organic” are often obscured. And how does grass “fed” compare to grass “finished”? How does Free range compare to cage-free…and how do those terms stack up against “pastured”? Maybe I should market my own term. “Honored”. Exactly! You have some nice friends 😉 This is exactly why I don’t particularly care to keep pigs past September. Our rainy clime is not a good place for pastured pigs during many months of the year. But that word, pasture, really gets people going. SSF, Salatin is always the first one to speak to the mistakes they’ve made, and changes those mistakes have brought about. Unfortunately most things people read about Salatin, are about Polyface, and are written by people who only interview. I don’t read much about Polyface anymore unless it is something actually written by Salatin himself or someone who is actually involved there. People only hear the sound bite and move on. We sold eggs at a particular high end restaurant in Portland, and on one delivery day another vendor inquired about our eggs, it was winter, and my husband said our hens are in a hoophouse on deep bedding. The other vendor was shocked! “Why Salatin pastures his animals all year round, why wouldn’t you?” He thought we were selling the restaurant short by keeping our hens in during the dead of winter, apparently he had heard Salatin speak and of course, only heard what he wanted to hear. Chris, it’s funny, most consumers think they are helping livestock by buying from a small farm,and many times it’s not really any better than the big guys, just different. Great post. And what if we didn’t tinker with our farms? What if we didn’t make changes? What if we just stuck to our dogma? The problem today is that people buy in to buzzwords. I’ll tell you a little secret. The absolute worst ‘grass only’ beef I’ve had was from Polyface. That taught me a lot. I’ve had excellent grass fed only beef (not even grain finished), but for many breeds if you have no marbling, you have no taste IMO. That said, the best pork I’ve had was from Polyface, but it is also the only place I’ve gotten it. The chickens were not as good as my friend who also produced that excellent beef. Said friends did learn from Joel, but they clearly had some superior practices. Rare, fastidious people who now left my state for the mid-west and over 1000 acres. Just wanted to encourage you to keep thinking and not buy in to the cause celeb of non-gmo/grass fed/organic blah blah blah. It can be great, but it can also be unwise. Thanks. Right on. We have to do what works here, on this farm, with our management ability. In some ways marketing becomes more difficult because we lack universal labels but marketing is VERY difficult if your product stinks. Thats where I’m at! I’m still building a winter space for the pigs. One is okay all winter on pasture. 5? its not so great, but do able….7 “adults” and a gaggle of piglets? yeah, not in Oregon. I used a dirt floor lean to last winter but the traffic just lowered the dirt level too much and their bedding started getting wet. This fall I poured concrete and am building another bigger better lean to. Unfortunately the pigs are in a mud hole until I get the building complete. the poor pig pasture is beat up. I hope it can recover…but its going to take some time. I don’t have farm experience, so I can’t properly weigh in on the 24/7 pasture/organics debate, but you definitely raise some valid points, and I agree that it’s better to do what you think is best for your animals than simply bow to popular opinion. 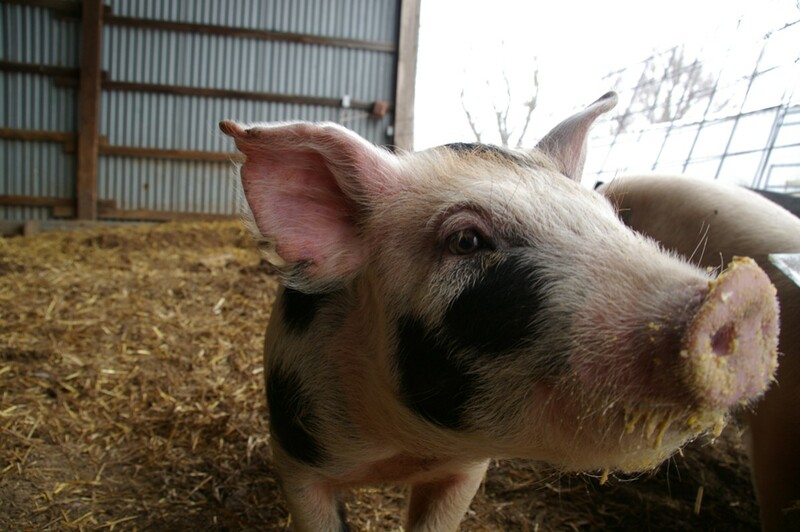 Also… your pig photo close-up; what a cutie!